A few weeks ago, I made the labor intensive zucchini relish recipe that is a favorite among many of our family and friends. One huge zucchini from Val's garden yielded eight cups of finely chopped green and white cubes. Add four cups of diced onions, a red pepper, some green peppers, that's a lot of chopping. Who knew such a concoction mixed with celery seed, sugar and salt could be so lipsmackingly delicious? It brightens up grilled chicken, tuna salad on thick white bread and makes a grilled hot dog into something out of this world. But to be able to have a jar on the dinner table in January means putting in the hard work in August when all I really want to do is spend the last few days before school starts again, on the beach with my feet in the sand and my chair directed toward the tide coming in and out. Waiting for September doesn't help. Less people in town make the beach and other outdoor activities even more inviting. The few hours I have to myself while the kids are in school are often spent doing the usual household chores but if I'm lucky, I might fit in a walk along the bike path in blissful silence or take in the view at Falmouth Harbor. But the harvest awaits! The cucumbers won't stop this year, either. They are growing long and green to the point where there are too many to eat in salads or used as vehicles to scoop up blue cheese dip. So, mother nature has me back in the kitchen again, firing up the canning pot to make two batches of dill pickles. Val's dill plant is more like a "tree" with many "branches" of dill flower heads. The garlic from the farmer's market is pungent and strong, and tastes so much spicier than the dried up heads I get at the supermarket. A few slices of bright red chili peppers make a nice looking contrast in the jars full of sliced green pickles. All together it tastes of a vinegary, spicy, sour bite. There are a lot of recipes in the repertoire that I won't get to this year before the time for freshly picked fruits and vegetables has gone by. But I am putting in an extreme effort to make at least one batch of jam before the leaves begin to fall. 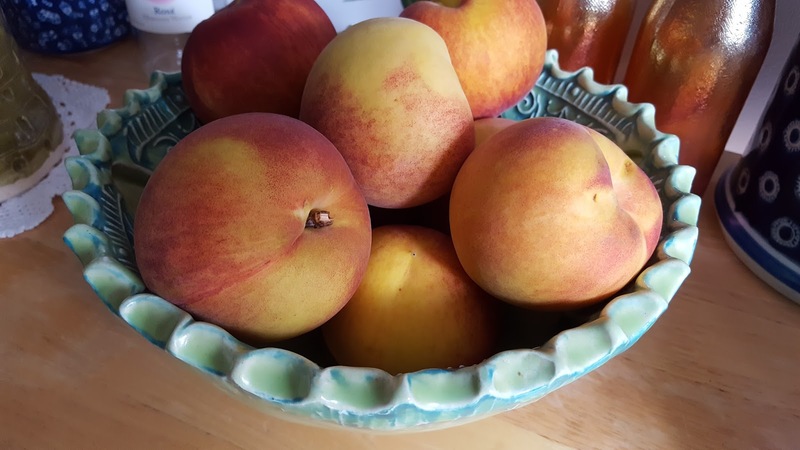 Val's Heavenly Peach Jam is actually a recipe given to her by the late Mrs. Eastman. Mrs. "E" commissioned Val to make numerous batches of this sweet concoction to be sold in the back section of Eastman's Hardware. The part of the store was called "Fannie's Corner" and displayed all sorts of delightful knick-knacks, Christmas ornaments, fancy candies in decorative tins and my favorite: an assortment of very large stuffed rabbits wearing knit sweaters. I could browse around that shop with it's creaky, lacquered wood floors for hours on end looking at all the treasures that Mrs. Eastman carefully curated. Her taste was impeccable, her style on point. Although I admired all the things that Mrs. Eastman displayed in her shop, this jam was not exactly a favorite of mine. Mostly because I preferred sweet jellies and jams along with peanut butter in a sandwich packed in my lunchbox for school. The peaches and the peanut butter just never seemed to make a good match to me and I longed for red raspberry or strawberry jelly in my sandwiches, instead. Perhaps it was the color. Bright orangy/yellow alongside the light brown peanut butter on white bread. Reminds me of the popular color scheme in the 1970's of burnt orange, brown and yellow, which then reminds me of shag carpeting and polyester leisure suits, ideas better left in the past. So, I am not sure why I am feeling so strongly about putting in the effort to make this jam. Perhaps because my palate has matured and I know how delicious, sweet and juicy a fresh peach can be. I want to be able to enjoy that burst of early Autumn flavor in the dead of winter on a piece of buttery toast while the snow falls outside my window. I've gathered my ingredients and found the jars and lids. All that is left now is to let the peaches soften up a bit. When I'm finished, I'll stash the jam in the cellar with my other preserved pantry items. Call me in January, when the snow is falling. I might just invite you over to enjoy the bounty from summer 2017. Peel peaches and slice into a large pot. Smash peaches leaving some larger pieces. Zest one orange and add it to the peaches. Peel and section oranges into the pot (discard connective membrane). On high heat, bring mixture to a full rolling boil, stirring constantly. Quickly stir in pectin and return to a full rolling boil for one minute while continuing to stir. After one minute, remove pot from heat and skim off any foam with a metal spoon. Ladle into prepared (sterilized) jars leaving 1/8" head space. Wipe jar rims and threads with a damp towel. Top with prepared lids and bands. Process in a canner for 10 minutes in boiling water. Remove from canner and allow to cool. After jars have cooled, test the seals making sure that they are tight. Tightly sealed jars can be stored in a cool, dry place for up to 12 months. If the seal is not tight, refrigerate and use the jam within 2 weeks.